Britax’s B-Ready 2017 is an all-terrain reversible-seat stroller that has ability to convert from single into a double inline stroller. You can use it with two stroller seats, two bassinets or two infant car seats. There are 12 different seating combinations to choose from! The B-Ready got a lot of great updates for 2017. The frame has been completely redesigned and now looks much more modern and sleek. The canopy provides more shade. The basket got even larger thanks to the detachable extension. The brake has a color indicator and is super flip-flop-friendly. The Click & Go System allows you to just click any Britax infant car seat right into the frame and you got a travel system. No adapters needed! The stroller still features: a roomy seat with a tall canopy, the swing-away bumper bar, a deep one-hand recline, adjustable leg rest, adjustable handlebar, all-wheel suspension, automatic lock, standing fold, and easy fold. The seat can accommodate a child from 6 months and up to 55 lbs (which is like 7-year old). I wanted to say a few words about the wheels and maneuverability. The hard rubber wheels provide a pretty smooth ride and will never go flat because they are filled with foam instead of air. Despite being foam-filled, I still consider them all-terrain because they can handle a lot of different terrain with ease. I know some parents will argue with me and say that unless they are air-filled they are not all-terrain. Well, the UPPAbaby Vista has very similar wheels in size and material and they advertise their stroller as all-terrain. In real life, these wheels are pretty large and will provide a smooth ride in most situations unless you go trail walking in the woods. I gave this buggy 5 out of 5 stars because it’s an amazing stroller very similar to Vista, but for much less. Love the new frame design and the new colors. The only thing that could be a problem for taller parents is the amount of leg room in the double mode when the second seat is reclined. I am 5’9 and I had to bring the handlebar down a little to get more room otherwise I was kicking the canopy of the second seat. While the stroller does NOT come with a bassinet, an infant car seat, nor a second seat, you can purchase them separately. It retails for around $499 and comes with a bumper bar. All other accessories need to be purchased separately. -Huge canopy. The canopy is huge! It has been upgraded a little bit from the previous version. It has two large panels plus a small pop-out sunvisor that go down all the way to the bumper bar. Plenty of sun protection! There is a large mesh peekaboo window with a MAGNETIC closure, so you can peek at your sleeping baby without waking him up. Can be a very important feature for a light sleeper. The dark mesh protects your child from the sun while allowing for the air to get in. -Adjustable handle bar. The handle bar goes from 35″ all the way up to 43″ from the ground. It has foam covering with a plastic grip in the middle for one-handed maneuverability. The foam cover is soft and much nicer to the touch than a rubber one, but of course it can get damaged more easily. -Roomy seat. The seat dimensions have not changed from the previous model. It’s 12″ wide with a 22″ seat back and 24″ from the back of the seat to the top of the canopy. With this canopy height even the tallest child will have no problem fitting in. It has one-hand four position recline that is operated by a lever in the back of the seat. The recline is deep, but doesn’t have a flat position, therefore it’s recommended for babies from 6 months and up to 55 lbs. If you want to use if from birth, you can turn it into a travel system or use it with a bassinet. -Reversible seat. The seat is REVERSIBLE! To reverse it, lift two levers on both sides of the seat, swing it around and snap it right back into the frame. Of course, you should remove your baby first, although I’ve done it with my daughter in the seat when she was little :) The seat has 12 different seating options! 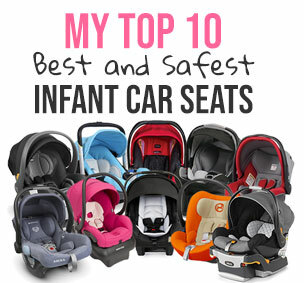 It can take two full size seats, two bassinets, or two infant car seats. Mix and match! BTW, the previous model had 14 seating options. -5-point harness. It has an adjustable 5-point harness with a center release buckle. The buckle is really great because it doesn’t fall into 5 puzzle pieces once you unlock it. The shoulder straps are attached to the waist straps so you can keep them together or you can separate them. The buckle is easy to unlock for parents, but not as easy for a toddler. -Second seat. You can purchase a second seat and turn B-Ready into a double inline stroller. The second seat can accommodate a child from birth and up to 35 lbs. It is 13″ wide and is 22″ high from the very bottom of the seat to the top of the canopy. It features 3 recline positions including a flat one suitable for a newborn. BTW, many inline strollers don’t have any recline on the second seat, so this is definitely a bonus. The 2nd seat is NOT reversible. Just like the main seat, it has adjustable padded 5-point harness and a good size canopy. You will definitely lose most of the space in the basket once you add the second seat. Fold with two seats is just as easy as with one and you can even leave both seats attached. If you want to use it with an infant car seat instead of the second seat, you will need to use adapters to install the it. One of the things parents always worry about is their child getting his fingers into the rear wheels. Thankfully, Britax thought about it so the second seat comes with the mud guards. -Bumper bar. INCLUDED! It is a swing-away removable bumper bar. I hate when a luxury stroller that you pay gazillion dollars for doesn’t include a bumper bar. The great thing about this bumper bar is that it’s covered with a removable canvas. If you need to wash it, just unzip the material. There is also no foam underneath so your kids can go ahead and bite it as much as they want. We all know they will give it a try! LOL. -Adjustable foot rest. The foot rest has two positions and goes all the way up to provide your child with extra flat surface. -Huge basket. The basket has been completely redesigned for 2017. It’s absolutely humongous and very easy to access not only from the back, but also from the front. You can fit TWO huge diaper bags with no problem. Of course things change when you add a second seat in the back since the child’s legs will take up most of the space. Even with the second passenger in the back you can get into the basket from the front. Once you lift up the leg rest you will see a large zipper opening that makes it super easy to put things in and out. -Storage pocket. There is a medium size store pocket in the back of the seat for small items like keys, cell phone or your lipstick. -All-terrain wheels. It has four foam filled rubber wheels with 8″ wheels in the front and 11″ wheels in the back. The wheel size stayed the same. The front wheels are swivel, but can be locked straight for more stability. Having foam is great because you will never get a flat and don’t need to add air like with air-filled tires. Usually a TRUE all-terrain stroller has air-filled tires, but I think that B-Ready is as close to being all-terrain as possible without having air-filled tires. It will handle many types of terrain like mulch, grass, gravel or uneven pavement. But, of course I would not walk forest trails with it. I would say that it’s an all-terrain stroller for regular everyday life. Also, I’ve noticed that UPPAbaby advertises Vista as an all-terrain stroller but it doesn’t have air-filled tires and the tire size is almost the same as on B-Ready. That being said, I think these wheels together with all-wheel suspension will provide your child with a smooth ride. -All-wheel suspension. I didn’t expect anything less for that price. -Parking brake. The brake has been totally upgraded and now is flip-flop-friendly! All you need to do is step on the pedal that has red/green indicator and it will lock both rear wheels. To unlock, step on it again. It’s like the best brake ever. No more scratches on your shoes! -Easy fold. You will need to use both hands for this one. The fold is very easy, but very bulky. You can always remove the rear wheels and the seat to fit it into a tight space. On the bright side, once you folded it has a standing fold and an automatic lock. You can fold it with one seat or even both seats attached. The folded dimensions with the seat attached are 24″W x 19″H x 42″L. I’ve seen a lot folds and I like it more when the seat folds like a book with the seat material being inside avoiding dirt and tear. -Car seat option. So before, you had to use a car seat adapter even for Britax infant car seats. Not any more! Now, any Britax infant car seats just click into the frame WITHOUT any adapters. The car seat can also face both ways! You will still need to get adapter for other popular models. -Bassinet option. You can turn this stroller into a stylish pram by replacing the seat with a bassinet (purchased separately). It retails for around $170. -Child’s Tray option. You can also get a child’s tray and click it into the frame instead of the bumper bar. I find that having a tray is very convenient. I personally don’t even switch it back to the bumper bar because my little angels is always eating something (Usually organic bunny crackers). She also likes to play with her little plastic animal toys and put then into the cup holder. -Heavy weight. The B-Ready is 28 lbs in single mode and 36 lbs in double mode. While it is heavy, there is really not much that can be done since to be stable with two seats, the stroller has to be heavy otherwise it will tip over. Get to the gym moms! LOL. -Fold in double mode. When you fold it in double mode without removing the second seat, the 2nd seat’s canopy drags collecting all the dirt on the ground. I would recommend removing the second seat before folding it. I found a great video review by Baby Gizmo. Take a look. -New color. There are new frame colors and seat colors. The seat comes in 5 different color combinations with a dark frame. -Large canopy. The canopy is still large, but the 2017 model has larger panels and smaller pop-out sunvisor. -Large basket. Instead of having side zippers, it has a large zipper in the front which makes it much easier to access your stuff if there is a second seat attached. Due to the added extension in the back, the basket is even larger now. The extension can be folded or removed to allow room for the second seat. -New frame design. The frame is totally different now. I looks much more modern and more similar to the Vista model. I do like the rounder leg rest and the exposed frame of the seat. The rims on the wheels have also been updated and now look more like Vista :) I feel like designers at Britax decided to make it look more like Vista model. – Click & Go System. Now you don’t need an adapter for any Britax infant car seats. They just click right into the frame of the stroller. -New brake. The brake is super flip-flop-friendly now. You press the pedal once and it locks the wheels. You press it another time and it unlocks them. -Seating options. There used to be 14 seating combinations and now there are only 12. Not a big deal at all. Britax provides only 2-year warranty from the original date of purchase and you have to be the original owner. Here is more information on the warranty. Britax B-Ready is available in five colors: black, poppy, mist, capri, and peridot. All models have a sleek dark grey frame. I buy most of my strollers on Amazon because it usually has the lowest prices, free shipping, free returns and no tax. You can get Britax B-Ready 2017 in one of the five beautiful colors for around $499 on Amazon (free shipping/free return and no sales tax). It comes with a bumper bar only. You can get a bassinet for around $170. This seems so similar to the vista. I am a FTM shopping for a stroller that will last. It seems as though by the time you add everything the vista comes with (bassinet, shields, etc.) the price difference is nominal since this doesn’t come with a bassinet or anything extra.